This generous 360g block is perfect for gifting to friends and family. Suitable for vegetarians. Kosher - KLBD. 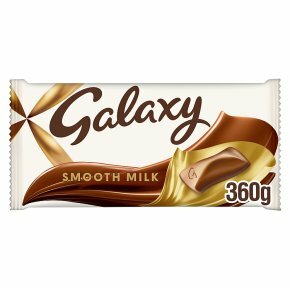 Perfect for Gifting - Galaxy Smooth and Creamy Milk Chocolate is a delicious and indulgent treat that can be enjoyed as part of a balanced diet and healthy lifestyle, lovingly created to melt in your mouth.